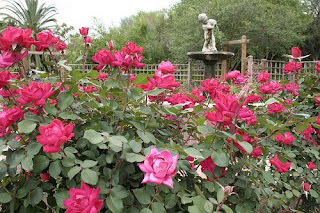 Growing Southern | Garden Blog: KnockOut Roses: a rose for the rest of us? I have enjoyed reading through a little on each of your blogs. I will visit often. One day I will share my experience of my then two and a half year old and a big jar of Vasoline. I like your article. 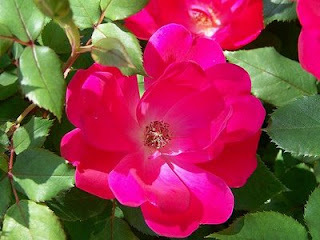 I am also planning in creating a garden and your blog is a great guide. I'm trying pyrethrum daisies this year to see if just growing them deters the bugs. I also intend to make a spray from them, but only do it at sunset as I have honey bees and don't want to kill them! Did not consciously try on a Japanese beetle, but a soapy solution usually helps against insects - just make sure it is rather mild. Have two Knockout rose plants started from a one gallon containers about 4 years ago. They are absolutely wonderful, require no care other than fertilizer and are now 6 ft tall by 6 ft wide and bloom profusely almost all year long in Mississippi. I prune Feb 14, and have taken them down to about two feet several years and they come in a month. We're in zone 8. Not really...I bought 4 Knockout roses at a really good quality nursery two weeks ago and they ALL have black spot already! And yes, I still have the tags on them so I know they're Knockouts (double red). I planted 8 more near them from Home Depot and those seem to be doing okay (only there 5 days so far). I am SO disappointed with those roses! I read somewhere they DO have a nice "nutty" fragrance? Good luck! knock out roses are just so easy to maintain! I can kill anything in my garden, but the knockouts just flower year after year!